The two new murals mark the opening of an exhibition of Jean-Michel Basquiat's artworks. Incognito graffiti artist Banksy is up to his old tricks again. 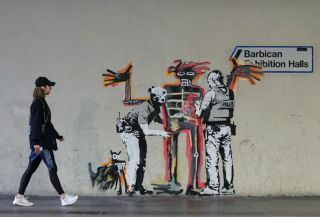 This time the street artist behind 2015's Dismaland exhibition has decorated a space near The Barbican in central London to mark the opening of an exhibition of work by American artist Jean-Michel Basquiat. The two new artworks have been confirmed as genuine Banksy originals after appearing on his Instagram page (the place where all the edgy artists hang out). They reference the work of the late New York City graffiti artist Basquiat. One of the murals depicts a Ferris wheel like the nearby London Eye whose cars have been replaced with crowns. This is a nod to the regal headwear that frequently appeared in Basquiat's work. On Instagram, Banksy accompanied this image with the caption: "Major new Basquiat show opens at the Barbican – a place that is normally very keen to clean any graffiti from its walls." The other mural uses Basquiat's 1982 work Boy and Dog in a Johnnypump as a starting point. Banksy builds on the image by adding police officers who frisk the boy in what appears to be a statement about how black and ethnic minority groups are treated by authorities. This image was captioned: "Portrait of Basquiat being welcomed by the Metropolitan Police – an (unofficial) collaboration with the new Basquiat show." The exhibition, Basquiat: Boom for Real, opens at the Barbican Centre on 21 September and runs until 28 January 2018. The Barbican describes the show as the "first large-scale exhibition in the UK of the work of... the pioneering prodigy of the 1980s downtown New York art scene." For fans of the prodigious graffiti artist turned painter, who died aged just 27 in 1988, this unprecedented exhibition offers a new way to engage with Basquiat's work. As well as bringing together over 100 works from international museums and private collections, the exhibition will also feature film, photography and archive material.